Players take turns alternating between the roles of cops and robbers; the robbers will try to steal as much money as possible, and the cops will try to arrest the robbers before they escape.Using their set of dice, the robbers will attempt to cut the bank's alarm and steal the precious diamonds. Then they will continue to steal as much money as possible by tearing through the safety-deposit boxes, and loading up their getaway cars. 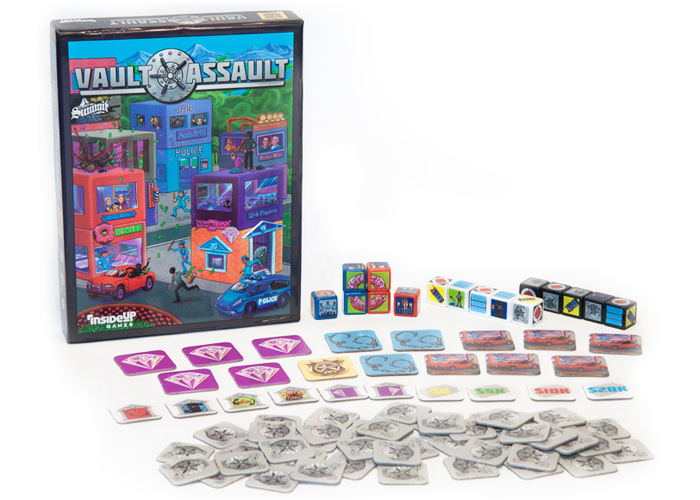 Although they can use hostages to keep the cops at bay for a short period, eventually they will have to gather their loot and escape as fast as possible.Meanwhile the cops, using their unique dice, will attempt to foil the robbers' plans by cleverly hiding the alarm's weak point, setting traps, and securing the diamonds. Then the cops will be rolling their dice to complete mosaics signaling the completion of each stage in the heistfrom fueling up at the donut shop, to getting dispatched in their cars, to surrounding the bank, and finally arresting the robbers before they can escape.After a set number of rounds, the game ends and players add up the value of their safety-deposit boxes along with any diamonds they have stolen. The player/team with the most valuable loot wins!